A couple weeks ago, we sponsored one of the greatest car shows that I’ve personally ever been to: Radwood 2. Together, with the guys from podcasts Driving While Awesome!, Cammed & Tubbed and Clutchkick, we threw down a show absolutely filled to the brim with 1980's and 1990's cars. Some people got super into it with the period-appropriate dress. Richard Chen got really into it—enough so that he got law enforcement involved. I first found out about Chen through an Instagram post, which showed him sitting on a plane with a suitcase filled with white powder and stacks of money. “TSA thought this was not very funny,” he captioned the post. Well, I thought it was freaking hilarious, so I reached out to Chen to get the full story. Chen lives in the Bay Area and grew up during the ‘80s. He had the foresight to hold onto one of his double-breasted suits with the power tie and suspenders, just in case. Fashion does tend to behave cyclically. The suit wound up making an appearance at Radwood 1, so Chen’s efforts paid off. Since a flight down to Orange County for Radwood 2 from the Bay Area is so short, Chen decided to make a day trip out of it wore the ensemble on the plane. In an email, he told me that he thought it would be fun to travel in full period-attire. And of course, he had to accessorize. 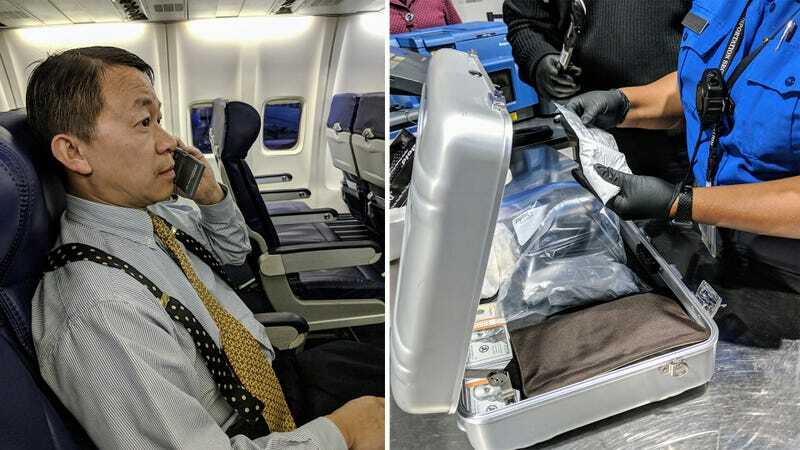 He was able to find a “proper Zero Halliburton case” on eBay and then proceeded to fill it with stacks of prop money bought a five-pound bag of powdered sugar. But, on the night before the show, it suddenly dawned on him that five pounds would be too heavy to drag around all day, so he decided to load the stuff into individual baggies instead. Way more convenient, I agree! Judgment day came. Aside from the aluminum briefcase, he carried no other luggage. Chen’s flip phone, which he stuck his boarding pass QR code to, passed without incident. Chen said he was “slightly heartened” by this. The briefcase did not pass. It got pulled aside. Thankfully, they didn’t elect to pat him down and he got on the plane without further incident. Chen arrived at Radwood, resplendent in his newly TSA-christened gear, a few hours later. The whole thing could have been avoided if Chen had just checked a bag and paid the fee, but where’s the fun in that? Occasionally, it can be fun to roll up to the airport, looking like a gangster and carrying no luggage except for an aluminum case filled with hundred-dollar bills and questionable white powder. If you have some time to kill and don’t mind some stern questioning, I highly encourage it. I only bought some hand warmers and a bandana for my Radwood outfit. Maybe I should take some pointers from Chen next year.